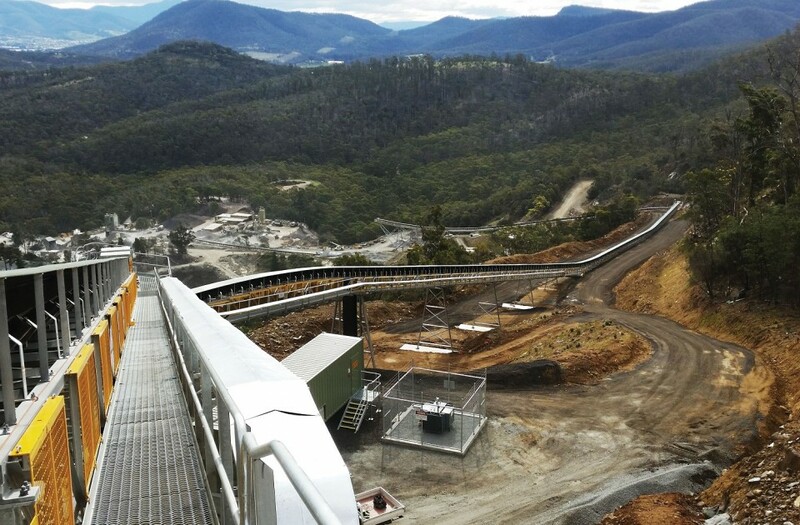 Earlier this year BRS had the privilege of working with the design and construction team delivering a new primary crushing plant for Hanson’s Hobart Quarry, including an innovative 840m long downhill conveying system to solve an operational issue of having to haul rock over a steeply inclined dirt road. The Hanson’s quarry won the award for “Environmental Innovation” at the Cement Concrete and Aggregates Australia Environmental, Health and Safety Awards in Melbourne on 27th October. The solution used the gravitational force produced by conveying material downhill to regenerate electrical energy, which was then consumed by the primary and secondary crushing plants on the site. The total solution meant that the site reduced their energy consumption and associated emissions. Tasmanian Government Minister for Resources Guy Barnett congratulated all involved on the “well-deserved award”. The solution developed in conjunction with Hitech Electrical Automation and Yasgawa’s matrix drives demonstrates a state of the are solution utilising the new matrix drive 4-quadrent drive technology. The award is great recognition for all involved in the delivery of the project. To see the plant in action, check out this video from Terex!